Lighting is so important for a room. 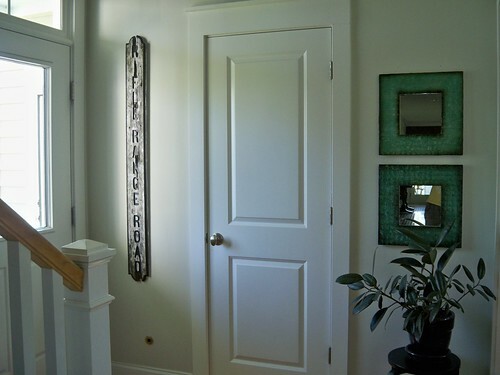 Not only does it create a mood, but the fixture itself will add interest to the space. 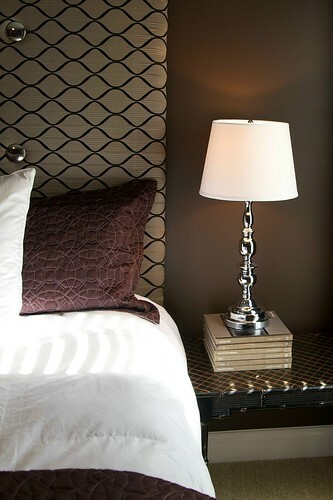 I prefer accent and task lighting as opposed to overhead, especially in a living space or bedroom. 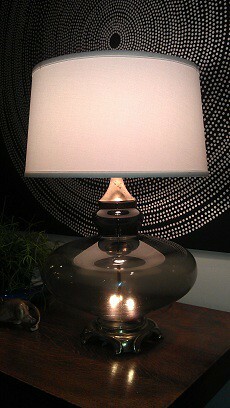 Coming across a great vintage lamp always gets me excited, I’m constantly changing them up! Here is one from the 60s, the base actually lights up as well. It’s modernized with a new shade. This is a pair that I found in PA, they are pre-60s. I saw them from a distance and the bubble glass totally attracted me. 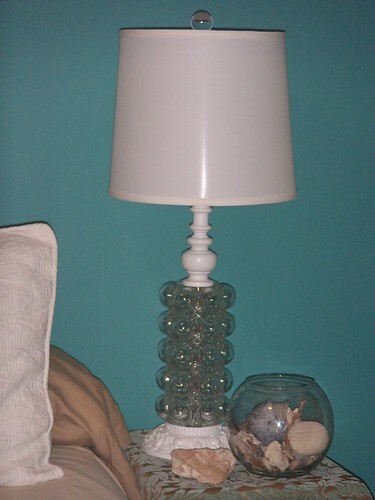 They needed rewired and painted and I bought new white shades and bubble glass finials to top them off. Right now they’re in my “catch-all/holding room” (aka guest room), but I think they’re staying! Art is very subjective, appealing to people in all different ways. Whether it’s an abstract, botanical, landscape, or portrait; a painting, illustration, photo or yes! 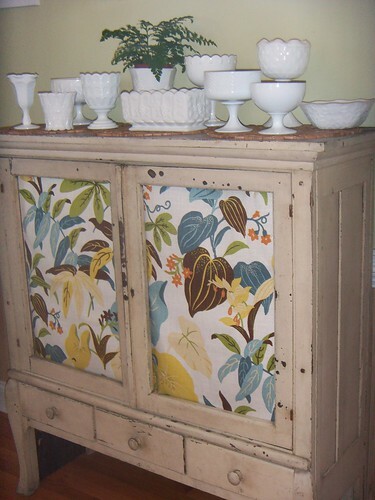 even fabric, it will dress your wall and help to complete a room. 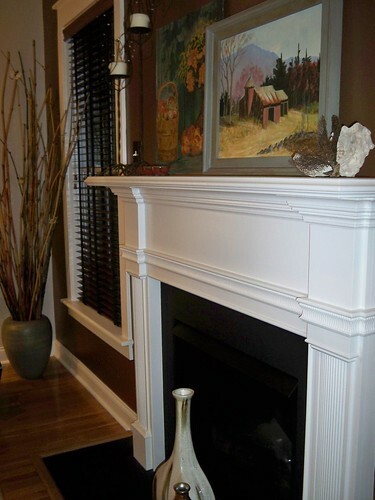 I tend to go for the warm-colored nature scenes in my own space. I found these two oil paintings at the local Habitat. 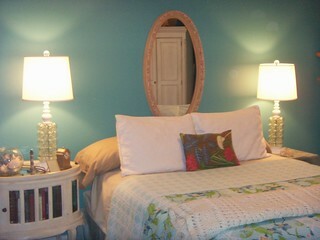 Here I repurposed two 1930s deco-styled porcelain light fixtures from our old house in downtown Charleston. My husband and I renovated and I thought these were neat so I wrapped them up and saved them. After moving to our new home, I wanted to use them somehow. I took out the old sockets and put in a shot glass for a vase. These are special and they’ll always remind me of our time spent downtown. I saw this old wooden street sign, RIFLE RANGE ROAD, at Habitat after a neighborhood donated them. 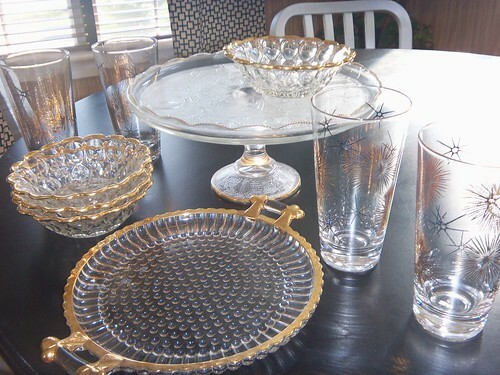 Oh accessories…the jewelry of the room! Vintage accessories are so much fun. Group them in a collection for impact or just one here and there for contrast. 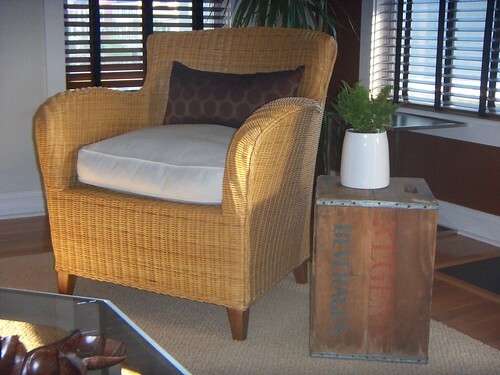 An old crate makes a great side table. 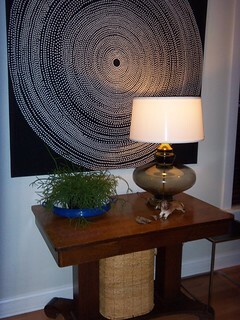 For contrast, try a vintage table with modern lighitng. 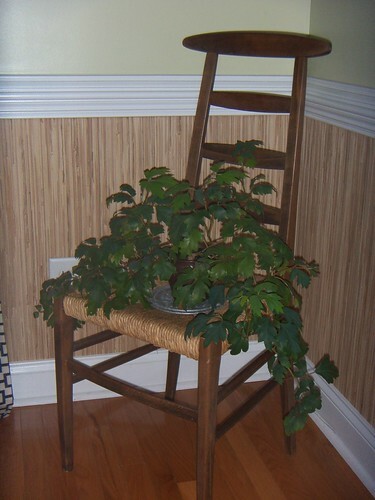 This old ladder-back chair is great in the corner of a dining room as a plant stand, but is also extra seating when needed. 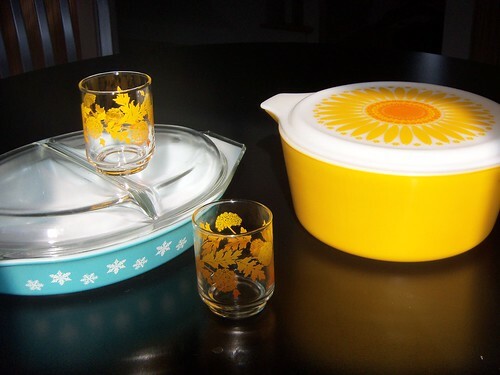 I love finding anything, especially something for entertaining, that is mid-century. I love the shapes, the colors and the sparkle of pieces back then! Great for that special occassion or for everyday. 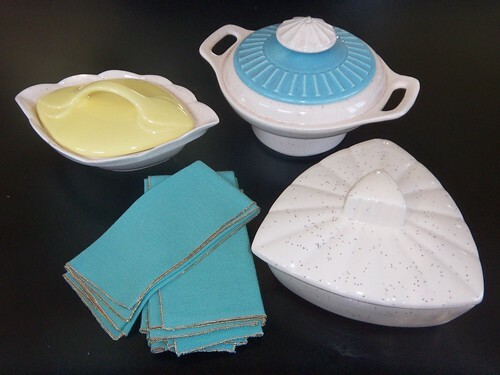 Anything with a lid will come in handy if you are entertaining outdoors (to keep the bugs off) or if you’re taking a dish to a party. Gotta love that sparkle…great for the holiday party! Remember, reusing what we already have has many benefits: it conserves energy that would be spent on new production, saves fuel and energy from shipping and saves space in our landfills just to name a few. And by shopping at your local consignment, thrift and restores, you are keeping them in business and providing jobs. 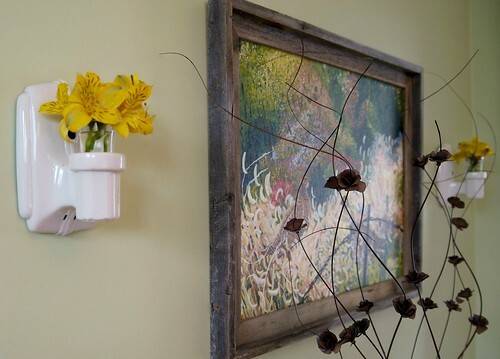 Hey, I buy new things too, but each piece that’s reused and repurposed makes a difference. We have so many beautiful things already here, so next time you’re out shopping for home, think about buying a piece with some soul!